What is the Sun like? The Sun is a yellow dwarf star at the center of our Solar System. All the planets of the Solar System orbit around the Sun. The Sun and the Solar System orbit around the center of our Galaxy, the Milky Way. 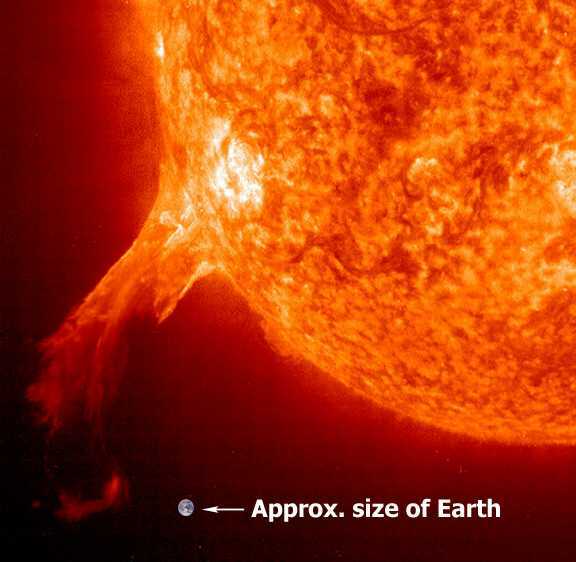 Although the Sun is a relatively small star in the universe, it is huge in relation to our solar system. Even with massive gas planets like Jupiter and Saturn, the Sun contains 99.8% of all the mass in the solar system. 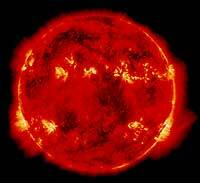 The Sun is made up of superheated hydrogen and helium gas. Hydrogen makes up about 74% of the mass of the Sun. 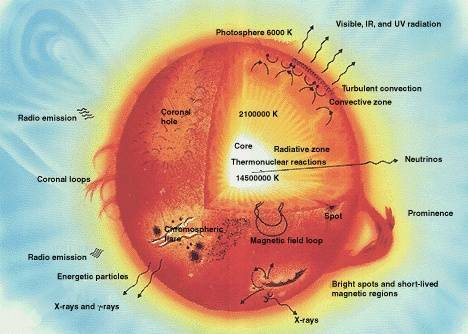 At the center of the Sun, hydrogen atoms, under intense pressure from gravity, undergo a process called nuclear fusion and get converted into helium atoms. The process of nuclear fusion generates a tremendous amount of heat causing radiation and eventually the sunlight that reaches the Earth. The Sun is the main source of energy in the Solar System and life on Earth. Plants use photosynthesis in order to harness energy from the Sun. Even energy that we get from fossil fuels like oil originally came from the Sun. We can also use solar cells to convert energy from the Sun directly into electricity. An eruption from the surface of the Sun. Source NASA. How do we know about the Sun? The Sun has been studied by humans, scientists, and astronomers for as long as people have been around. In the 16th and 17th centuries astronomers like Galileo and Isaac Newton began to study the Sun and learned that planets orbit the Sun due to gravity. In the early 1900's Albert Einstein used the formula E=MC^2 to explain how the Sun generated so much energy. In 1920 Arthur Eddington explained how the intense pressures at the center of the Sun could produce nuclear fusion and, in turn, great amounts of heat and energy. Since 1959 many space missions have observed and studied the Sun, its solar winds, and sun spots to give us more and more information about the Sun and this giant center of the Solar System. The Sun as seen from the International Space Station. The Sun is officially classified as a G-type main sequence star. The distance from the Sun to the Earth is used for a standard unit of measurement called the Astronomical Unit (au). The Sun has been worshiped as a god by many cultures including the Ancient Egyptian Sun god Ra. The Sun orbits the center of the Milky Way. It takes between 225 million and 250 million years for the Sun to complete its orbit through the Milky Way. The Sun is expected to remain stable for the next 5 billion years. The outer atmosphere of the Sun constantly releases a stream of charged particles called the Solar Wind.